Fully updated Oneiric as of this writing, here's a surefire way to kernel panic. The test suite starts to run and before you can blink, X dies and you get kernel panic on the console. I think it's related to ecryptfs because if you instead do all the above in /tmp, it works just fine. Error: command ['gksu', '-D', 'Apport', '--', '/usr/share/apport/dump_acpi_tables.py'] failed with exit code 1: Sorry, try again. Note that the -j 50 is crucial too. Without that, no panic. System was performing a large update through update manager, 300mb or so of deb files. This would follow the symptoms of the Python testing where heavy hard drive use could be the cause. Is this on a SSD or HDD? >Is this on a SSD or HDD? Could someone more familiar with ecryptfs please check to see if this and 836513 are related. I am seeing the same thing in different circumstances: while developing Launchpad, running "utilities/start-dev-soyuz.sh" and then "make run_all", I've seen the similar OOPS like in comment #23 twice now (i.e. exception in decrypt_scatterlist, vs. the OOPS from bug 836513 which happens in encrypt_scatterlist). The worst thing is that system seems to remain usable (except that gnome-screensaver locks you out of the system until you kill it from a virtual console or ssh), but after you reboot, your changes/new files created after the panic are lost. I confirmed exactly because I am seeing it in the latest kernel version "Package: linux-image-3.0.0-12-generic 3.0.0-12.20" as indicated in the duplicate bug report I filed. I am re-confirming hoping the lpltk bot doesn't mark it as incomplete again. Added tasks for Oneiric and Precise. This seems relatively straightforward to reproduce and as such should probably be triaged, fixed, and SRU'd to 11.10. Would it be possible for you to test the latest upstream kernel? It will allow additional upstream developers to examine the issue. Refer to https://wiki.ubuntu.com/KernelMainlineBuilds . Please test the release candidate kernel versus the daily build. Once you've tested the upstream kernel, please remove the 'needs-upstream-testing' tag. This can be done by clicking on the yellow pencil icon next to the tag located at the bottom of the bug description and deleting the 'needs-upstream-testing' text. Please let us know your results. It would also be helpful if you could test the mainline kernel as well. That will tell us if this is already fixed upstream. Was this an issue in prior releases, or is this an Oneiric regression? 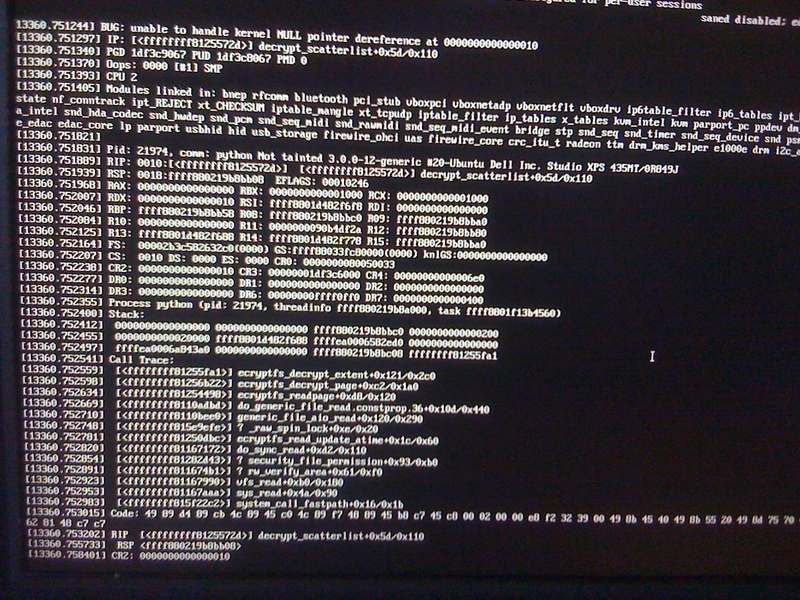 Here's a screen shot (crappy old iphone :) of the kernel panic. Yes, it's an Oneiric regression and I'll try to run it again on the mainline kernel. Nice too that you can still ssh in and do a clean reboot. Thanks for that hint. Confirmed on Oneiric *not* to kernel panic. Full Python test suite completed successfully (well, with an unrelated upstream unit test failure :). I just got it with amd64 kernel from http://kernel.ubuntu.com/~kernel-ppa/mainline/v3.1-rc9-oneiric. I tried to take a screenshot with my phone, but was too late (and Ctrl-Alt-F1 won't bring me back to the virtual console) and I only have a crappy overexposed photo. However, dmesg output from http://pastebin.ubuntu.com/711741/ matches exactly what was on the screen for 10-15 seconds before it got me back to the UI. FWIW, bug 836513 does have a similar traceback (as I noted above in comment #28), but it's in encrypt_scatterlist, while our tracebacks are in decrypt_scatterlist. Also, since there are plenty more duplicates now, details of my system and how I am triggering the bug are in bug 873199. Only my /home is encrypted. Off to reboot again. This is the fix I've written against the 3.1-rc10 kernel. I plan on testing the error paths a little more and sending it to the eCryptfs and linux-fsdevel lists for peer review before committing it upstream. It doesn't apply cleanly to the oneiric kernel sources (due to bf6c7f6c7bd0ea779757d35b5fdc9f9157f056b3), but it is a trivial cleanup when that time comes. The attachment "[PATCH] eCryptfs: Prevent file create race condition" of this bug report has been identified as being a patch. The ubuntu-reviewers team has been subscribed to the bug report so that they can review the patch. In the event that this is in fact not a patch you can resolve this situation by removing the tag 'patch' from the bug report and editing the attachment so that it is not flagged as a patch. Additionally, if you are member of the ubuntu-sponsors please also unsubscribe the team from this bug report. I'd be happy to test the above patch out, but I lack the time to compile my own kernel. If there's a deb package, I'd happily stress test it to see if I can hit the problem again (or uncover any other problems). Oct 26 22:28:10 fqc-book kernel: [326923.537078] kernel BUG at /build/buildd/linux-3.0.0/fs/ecryptfs/crypto.c:348! I am getting this crash occasionally since my initial report (dup Bug #876891) and usually on shutdown. Not doing anything special or fancy, just basic stuff like Firefox and Update Manager. Really annoying, but at least I am not losing any work (so far). This is the version of the patch that I intend to upstream. It is against kernel version 3.2-rc1. This bug should be considered a security issue since one could implement a denial of service on a server using encrypted home. By the way, I'm using a SSD. First I was afraid of cells dying away. I tested the original crash reproduction recipe on both the current Python 2.7 and 3.3 mercurial branches. No kernel panic in either case. I suppose it's possible that something else changed in Python or 11.10 to avoid the crash, but I doubt it for Python 2.7. So I think the oneiric-proposed kernel does fix the original bug report. Thanks!